An affectionate pig named Wilbur befriends a spider named Charlotte, who lives in the rafters above his pen. In this story of friendship, hardship and the passing on into time, White reminds readers to open their eyes to the wonder and miracle found in the simplest things. 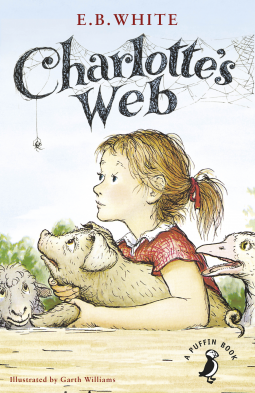 Delving back into the world of Charlotte's Web is such a treat and reminds me why I fell in love with this book growing up. It's just an amazing well-crafted tale of loyalty, friendship and life. The book begins with the idyllic tale of how Wilbur the piglet was saved from the axe by a kind little girl named Fern. She took the runt under her wings and nursed him. Just when he grew accustomed to his life, he discovers he is likely to end up on the chopping board as next Christmas' ham. But then, a spider living overhead heard his pleas and decided to lend him a helping hand. Penguin Books prompted me to return back to this childhood favourite as part of the newly launched "A Puffin Book" logo. In addition to the well-loved tale, they have included a few extra features such as "Where did the story come from?" and a quiz for children to see how well they remembered the book. A familiar childhood novel that has been given some extra features under a new logo. If you haven't read this story yet, you must give it a try. If you have read it whilst growing up, now would be a good time to find it on your bookshelf and give it a reread. Disclaimer: a complimentary preview was provided to me by the publisher via NetGalley in exchange for an honest review. The views expressed above are entirely my own and are in, no way, affected by the source of this book.